Once known for its quirky remote-controlled robot balls, Sphero parlayed that technology into a massive consumer hit with its Star Wars: The Force Awakens BB-8 toy. As a result, the company has been able to expand beyond the sphere, first with a robotic version of Cars’ Lightning McQueen, and now with an interactive Spider-Man figure that chats with kids. Back in early 2015 Mattel revealed a similar interactive toy called Hello Barbie that was packed with electronics, including a microphone and Wi-fi, that enabled the doll to interact with kids through intelligent conversations. Technologically it was impressive, but that was eventually overshadowed by controversy after security researchers found the toy was using vulnerable encryption to send conversations with children to the cloud for processing. Hello Barbie worked essentially the same way as online assistants like Siri and Alexa do, but because it was designed for kids, parents were (rightfully) concerned about the privacy risks, and the toy was never able to shake the controversy. Two years later privacy remains a hot-button issue in the toy industry as toys continue to get smarter, so Sphero is playing extra safe with its new Spider-Man Interactive App-Enabled Super Hero toy by keeping everything it does offline. 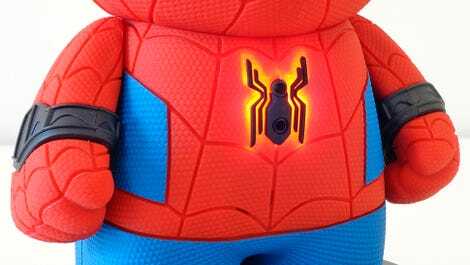 Wrapped in a rubber suit, Spider-Man’s electronics should survive the rigours of playtime with a kid. Standing just shy of nine-inches tall, Sphero’s new Spider-Man toy isn’t quite an action figure because its only articulated features are a pair of arms that rotate at the shoulders. That being said, kids can still run around a room with Spidey pretending to fight baddies, as a built-in motion sensor triggers sound effects like punches, kicks, and Spider-Man’s web shooters. A better way to describe Sphero’s new toy is as an Echo, Amazon’s Alexa-powered intelligent speaker, for kids. 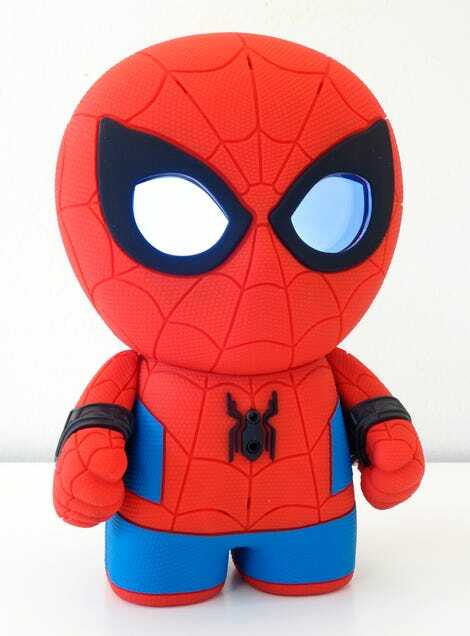 But instead of playing music, providing weather updates, or turning on appliances, Sphero’s Spider-Man Interactive App-Enabled Super Hero toy lets kids chat with the web crawler, listen to stories and jokes, and participate in villain battles that play out like a Choose Your Own Adventure book. Everything the toy can do is definitely geared towards kids, however. Anyone over 10-years-old will quickly find Spider-Man’s jokes and random quips a little tiresome. And the adventures all tend to play out the same way: listen, respond, listen, respond, etc. That’s fine for a kid who’s watched Finding Nemo a hundred times, but this Spidey toy simply isn’t geared towards older fans. Thanks to a pair of LCD displays, Spider-Man’s expressive eyes match those in the comic books. 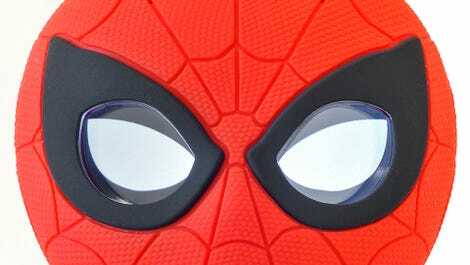 In addition to responding in Spider-Man’s voice (recorded by a new actor, not Tom Holland, Andrew Garfield, or Tobey Maguire) the toy uses a pair of custom-shaped LCDs to create an expressive pair of animated eyes that genuinely help to bring the completely static toy to life. Remember how excited everyone was when the latest movie version of Spider-Man could squint his eyes? An accompanying iOS and Android app is required to set up the toy. The toy also connects to a free accompanying app on iOS and Android devices, unlocking additional features like a Guard Mode for detecting intruders in a room, or tracking how many missions or adventures kids have completed. But the app isn’t optional, and is the only way to actually set up the toy out of the box, so parents will need to factor in the cost of a mobile device a kid can use, in addition to Spidey’s £150 price tag. That adds up quickly. One thing parents will like about the toy, is Sphero’s dedication to privacy. Unlike Siri, Alexa, and Google Assistant, which share voice commands with the cloud to process what’s being asked, all of Spider-Man’s voice recognition is handled by a dedicated chip inside the toy. Nothing is shared or stored online, and while the toy does connect to your home’s wi-fi network, that connection is only used for downloading software updates, and additional content. Spider-Man only listens to your commands while his logo is glowing. Furthermore, Spider-Man only listens to commands after the spider logo on his chest has been double-pressed, or during the back-and-forth conversation of an adventure. If that logo isn’t glowing, the toy’s microphone isn’t active, providing further reassurance to parents that Sphero isn’t secretly trying to harvest demographic info about their kids.